I've been fairly lazy this year with my fragrances - particularly newer fragrances. Although I'm a collector, I tend to use the same ones again and again and neglect newer bottles. In 2016, I plan on changing this. I've already begun, with cracking open the beautiful I Am Juicy Couture Eau de Parfum that was gifted to me a short while ago. This is my very first Juicy Couture fragrance, and I wasn't too sure what to expect. When I think of Juicy Couture, my heart is torn. Despite the fact the brand is so well known and actually rather beautiful, fake products tend to attract a not so classy crowd. In saying that though, I think the design is actually very pretty, albeit a tad ostentatious. Juicy Couture describes this fragrance as being directed at independent, non-apologetic and rebellious girls. I feel like they really nailed it. The fragrance itself is actually gorgeous. I was expecting something that a teenage Kardashian wannabe would wear, but I was pleasantly surprised. Floral yet fruity with top notes of raspberry, passionfruit and pomelo, while heart notes blossom with gardenia, heliotrope, sweet pea and rose de mal; rounding off with base notes of soft musk, warm woods and amber. Altogether a stunning scent for the summer months. As it is so fragrance, I prefer to wear this during the day, but it can be worn for evening occasions, too. The detail on the bottle is incredibly detailed. Whilst this is not my personal taste, I have to admit it really is beautifully designed. It certainly gives my vanity a touch of glamour. Despite the slightly ostentatious bottle, the fragrance is truly a beautiful one, and has been the perfect scent so far for summer. Although Juicy Couture has aimed this fragrance at a younger generation, I feel the fragrance itself is lovely enough to be suitable for all ages, and I wouldn't hesitate to gift this to an older woman in my life. I'm incredibly impressed with this fragrance, and will continue to love it into 2016. 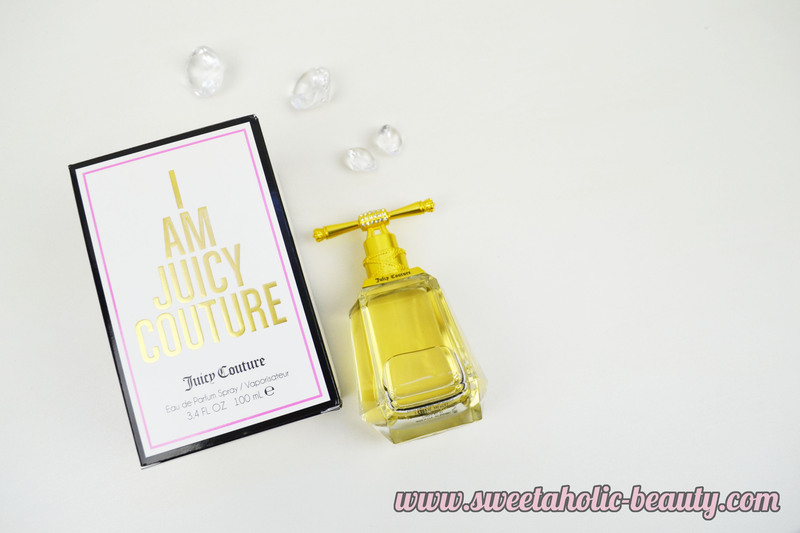 Have you tried the I Am Juicy Couture Eau de Parfum? If so, what are your thoughts? What an interesting bottle. I will have to check this out in stores! I haven't tried the 'I Am Juicy Couture' fragrance yet but I love the original 'Juicy Couture' fragrance. I love the blingy bottle lid! It sounds really nice, provided the garnia isn't too strong. The bottle is pretty cool, not really to my taste but cool enough to warrant a place on the vanity. I must sniff this one next time I'm in stores. This sounds really pretty. I have liked some of their scents in the past, which I was surprised by.